Typical Vivaro: Highly flexible, economical – available to order from October 2019. 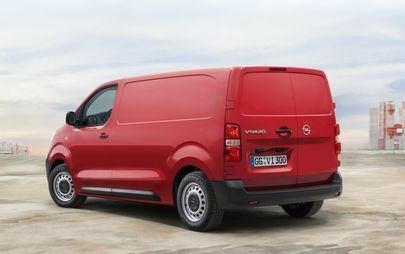 ﻿The rapidly growing market for midsize delivery vans will welcome the launch of the third generation of the Opel Vivaro. Since 2001, the Vivaro has built a strong reputation as a cargo carrier or office on wheels, with around one million units rolling off the assembly line. With specifications tailored to different driver needs, and numerous innovative technologies, the new Vivaro can perform every job better than ever before. In future, Opel will also have responsibility for the global development of light commercial vehicles for the whole of Groupe PSA. Based on a state-of-the-art platform, available to order as of October 2019, the Opel Vivaro offers a range tailored to customer needs – a Cargo panel van, a crew cab for up to six occupants, a platform chassis and a Combi people-carrier, plus – for the first time – three instead of two lengths (4.60 metres, 4.95m and 5.30m). With a maximum cargo capacity of 6.6 cubic metres, the new Vivaro has a payload of up to 1,400 kilogrammes – 200kg more than its predecessor. The same applies to towing weights: the maximum trailer load of 2,500kg is half a tonne higher than before. Only the height is modest, with most variants measuring about 1.90m. The new Vivaro can therefore access parking in basements or car parks with low ceilings, which makes loading and unloading easier. Stability and safety on a variety of slippery surfaces – mud, sand or snow – is provided by the advanced IntelliGrip traction control system. Higher ground clearance and underbody protection is available with the additional work-site set-up. Unrestricted access to the cargo area is provided by the wide rear and sliding side doors. Especially practical are the sliding side doors that, for the first time on the Vivaro, open automatically. A foot movement towards the sensors is all that’s needed from outside the vehicle. Objects up to 4.02m long can be stowed securely in the 5.30m version thanks to the Flex-Cargo load-through under the front passenger seat. Inside the new Vivaro, drivers and passengers feel as if they are in a passenger car: systems such as Head up display, 180o Rear View Camera, Forward Collision Alert, Automatic Emergency Braking and Cruise Control make for relaxed driving. Thanks to the ergonomic seating position, all the controls are within good view and easy reach of drivers. The latter are well connected thanks to state-of-the-art infotainment systems. With the new Vivaro, Opel continues to implement the PACE! strategic plan by investing in growing market segments with high volumes. Already in 2020 the range of efficient powertrains will extend to include a purely battery electric version. Opel will thus begin the electrification of its LCV portfolio and the Vivaro will not only be ready for work in villages or urban outskirts, it also be able to cover the much-discussed “last mile” in inner cities. ﻿Groupe PSA is the leader in the European LCV business. Thanks to the shared platform, the new Opel Vivaro therefore comes in three lengths. The particularly compact 4.60m version closes the gap between the van and the transporter segments, and with a turning circle of only 11.3m it is also very agile. This variant already offers 4.6m3 of cargo capacity, which can be increased to 5.1m3 thanks to the practical FlexCargo load-through on the front passenger side. This enables objects up to 3.32m long instead of 2.16m to be carried. The 4.95m and 5.30m versions have maximum cargo capacities of 5.8 and 6.6m3 respectively. The interior of the Vivaro thus comfortably accommodates ladders or panels up to 3.67 or 4.02m in length, as well as numerous small items in the multitude of storage spaces throughout the cockpit. The new Vivaro generation, with up to 2,500kg towing capacity, is not only a versatile transporter; in the flick of a wrist it also turns into an office on wheels. Thanks to FlexCargo, the back of the middle seat folds down to become a table for documents, a notebook or a tablet. Practicality begins with accessing the vehicle. In order to load via the sliding side doors, it is not necessary to put cargo or packages down, as a kick-like movement of the foot is sufficient to open the doors automatically (sensor-controlled sliding doors are offered for the first time by the new generation). Thanks to the multitude of seating adjustments – some of them electric – lumbar support and armrest, the driver-oriented cockpit is as comfortable as that of a passenger car. The numerous assistance systems – unusual in this class – ensure that the same applies to safety. Adaptive Cruise Control, which adjusts the speed according to that of the preceding vehicle. The Multimedia Radio and Multimedia Navi Pro infotainment systems come with the large 7.0-inch touchscreen. Both feature phone integration via Apple CarPlay and Android Auto. Multimedia Navi Pro additionally features European navigation with 3D view. 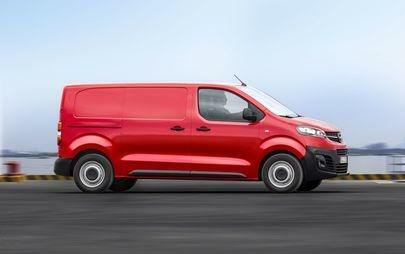 The new Vivaro’s appeal is not only based on load-carrying capability and passenger-car-like technologies. In addition to state-of-the-art engines, smooth-shifting transmissions, such as an eight-speed automatic, contribute to efficiency and comfort – highly important, especially for the fleet market. Service intervals of up to 50,000 km further reduce operating costs. Features such as the high-positioned headlamps and the maximum height of 1.90m for most variants lower the risk of damage, for example during parking. All of which makes the new-generation Vivaro one of the most economical competitors on the market.